This fantastic gardener's money box from Ruddick Garden Gifts is made from powder coated steel but looks and feels like ceramic. The money box is available in two colours, dark green and dark blue and has a securely fitted FSC Beech wood lid. 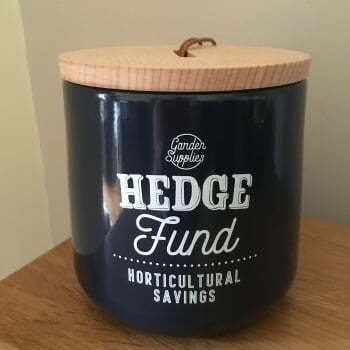 The slogan on the money box reads " Hedge Fund - Horticultural Savings " and is a great gift for anyone who loves spending money on their garden.